The hunting season for 2017 is in full swing and one of the biggest components to hunting—besides a gun—is what you wear, as in camouflage! You’ve already had early season practice at your local firing range, so now it’s time to gain the upper edge by investing in some great camouflage. The biggest question is,Why do you need camouflage? When we think of camouflage, we think of the military and blending in, in addition to keeping a low-profile on the battlefield. 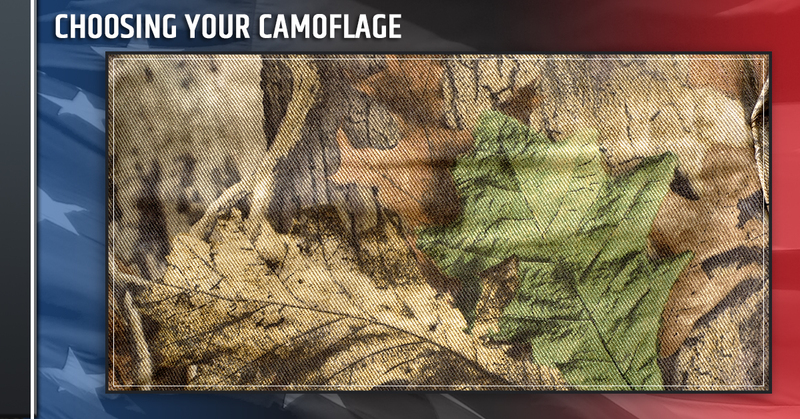 Hunters began using camouflage to increase their odds and take their game to the next level. Because wildlife cannot differentiate colors, having patterns that blend into the landscape is beneficial. Camouflage clothing – Animals have acute vision to help them detect predators. Again, the color may not matter as much as the pattern. After all, you would not use a swamp pattern in the winter woods! When purchasing camo, pay close attention to the buttons; if your button is too shiny it might catch the eye of your game. Scent elimination – This criteria is critical in hunting if you want to avoid losing game. Animals in general, have a very keen sense of smell, and this alone is one of the primary defense factors they have for predators. Their highly sensitive sense of smell can catch your scent way off in the distance. In addition to scent elimination camo, make sure you are free of any odor or smell. To be extra cautious, spray a scent eliminator as well. Breathability – This component is important if you’re hunting in heavy clothing in colder weather. The breathability criteria aids in scent elimination as well. If you have clothing that is well vented, it keeps you dry and comfortable along with airing your scent away from your body. When purchasing clothing for breathability, also look for and count pockets. It’s always nice to have places to put and access gear easily. Comfort – When you’re out hunting, you’re out for long periods of time, and comfort in while out in the elements, can make a much pleasurable experience. Consider layering and moisture wicking fabrics! Washability – Some companies still produce silk camouflage, which makes washing it a chore. When you’re shopping, check the tag and make sure it’s machine washable. This is especially nice if you have a bust hunting season and have to wash your clothing multiple times during the season. Another thing to consider is, if it’s tough enough to survive the washing machine, it will surely survive the elements. When you’re out for your first hunting season, always consider camo for the climate and terrain you’re in. Take special precautions in gathering pieces that will only benefit the hunt. Scent elimination, breathability, and washability pieces aid in a good hunting season. You can still take advantage of the 2017 hunting season! Check out Liberty Firearms Institute for a hunter’s safety course! Contact LFI today!